Nokia has launched a service that gives people free access to a store that holds two million music tracks. The Comes with Music handset will be available only from the UK's Carphone Warehouse on a pre-paid basis. Although the music catalogue available will be far less than that offered by Apple's iTunes, analysts forecast it could become a serious rival. The bundled phone goes on sale in October and Carphone Warehouse is currently taking pre-orders. 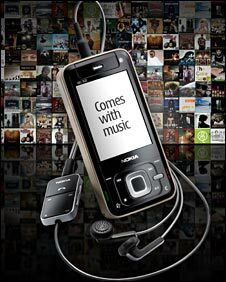 The service gives people a year of unlimited access to the Nokia Music Store catalogue. Users can transfer downloaded music to their PCs and will be able to keep all downloaded tracks after the year is over. "We believe that Comes With Music will transform the way people enjoy music," said Tero Ojanpera, head of Nokia's entertainment and communities business said in a statement "With unlimited music access for a year, you can enjoy your favorite artists or delve into new genres without having to worry about individual track or album purchases." Most analysts see the UK launch as a test-bed for a global launch of the service. "Everyone is looking to Apple as the benchmark for mobile music and this is going to be an important step for Nokia," said Paulo Pescatore, an analyst with research firm CCS Insight. The service will be available to anyone who buys the 5310 Nokia handset. The handset is currently available for around £69. Prices for the newly-bundled handset have not yet been announced but Mr Pescatore estimates it will cost about £170. So far none of the mobile operators have signed up to the service, perhaps because they are unwilling to undermine their own mobile music services, said Mr Pescatore. Operator's own services have been significantly ramped up in the last few months with Vodafone relaunching its music store and O2 signing deals with record label BMG and digital music store Napster. "We want to make sure we offer our customers a wide choice of options to get the maximum benefit of music through 02 and will be watching Nokia's "Comes with Music" package with interest," said Antony Douglas, head of content at 02. Vodafone's MusicStation costs £1.99 a week and gives customers unlimited access to a catalogue of 1.2 million songs. In France, Orange has recently launched a service free of anti-piracy controls (aka DRM) which offers customers 500 tracks per month for 12 euros. "This is a taste of where we are heading. The next wave for music on mobiles will be DRM-free (Digital Rights Management)" predicted Mr Pescatore.